Hi all! This blog has always been a bit of a lost cause, and it's been mostly for news and updates on the books. I've redone my website in more of a blog-esque fashion, so it's time to say farewell to this one. From now on, you can find all the news about me and the books at my new and improved website.There's also more to see, with extras that I'll be adding to and a lot more information overall. Thanks to all the folks who came (and will still come) by to say hello. Come join me at the new place! I'll be doing a writers workshop on April 9 at FoxTale Book Shoppe in Woodstock, GA. 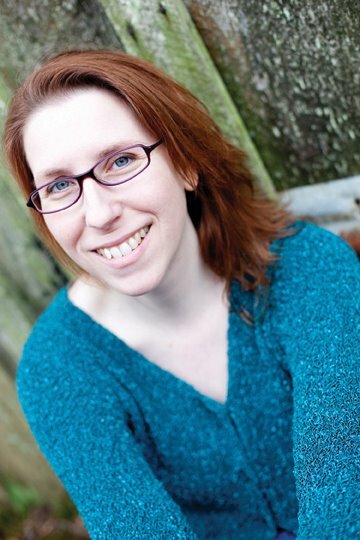 While it's aimed at those writing for teens, the techniques are the same so writers of adult work can also benefit. As young adult fiction continues to grow as a writing genre, so does the demand for quality, publishable writing. If you are currently writing young adult fiction with an eye towards publishing, you will not want to miss this unique opportunity to work with an expert in the field. Join novelist Janice Hardy for this half-day workshop that focuses on how point-of-view can fix commonly seen problems in your manuscript: telling, not showing, info-dumping, back story, weak character goals and motivations, low stakes, and more. 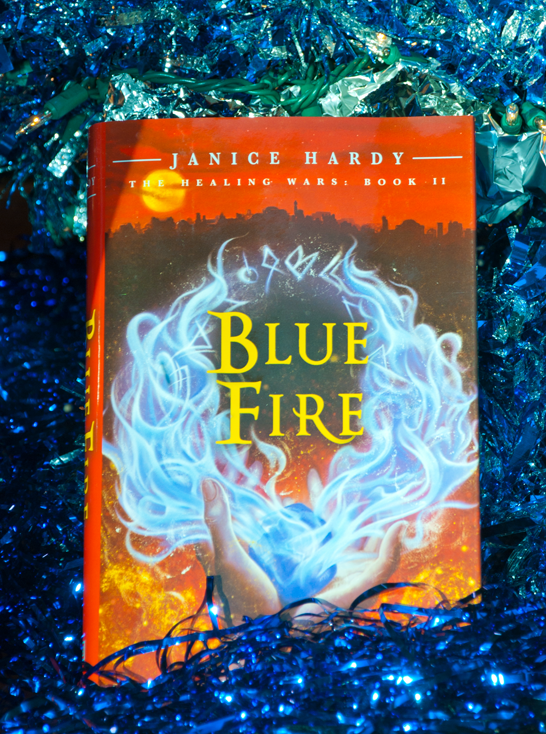 Bring those frustrating sections of your book, and work with Janice to get inside the head of your character and help you get your story moving in the right direction. So that workshop participants can get the most out of this period of instruction, the class will be capped at fifteen attendees. Sign up today by linking to www.foxtalebookshoppe.com and registering online, or call FoxTale at: 770/516-9989. 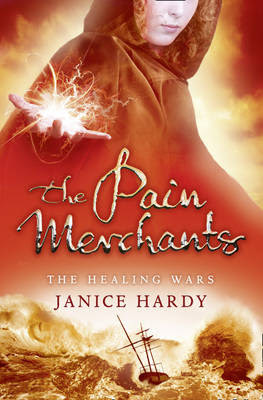 I'm delighted and excited to anounce that The Pain Merchants (the UK version of The Shifter) is on the shortlist for the 2011 Waterstone's Children's Book Prize! The winner will be announced February 9, 2011. This is so very very cool. The Shifter (US version) also got some love of its own and has been nominated for the 2011-2012 Truman Readers Award. The winner there will be announced April 2012. So far, 2011 is starting off on a pretty darn good foot. You know, you'd think I'd be better about updating these things, but it always slips my mind. I might have to make that a New Year's Resolution this year. Remember to update the blog about events! 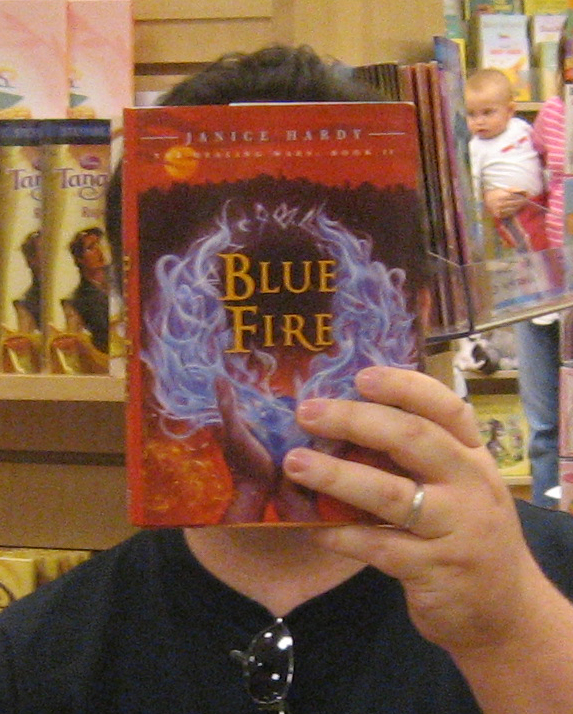 I'll be at Barnes & Noble this evening at the Otwell Middle School Book Fair. It's open to everyone, and supports the school, so come on by, say hello, and get some books. They don't even have to be mine, though that would be nice. For those of you in the Gainesville, GA area, I'll be at Hall Book Exchange this Saturday at their 24-hour Read-A-Thon. I'll be appearing from 2-3pm. The Traveling Launch Party was a success, and fun was had by hopefully all. I know I had a great time. 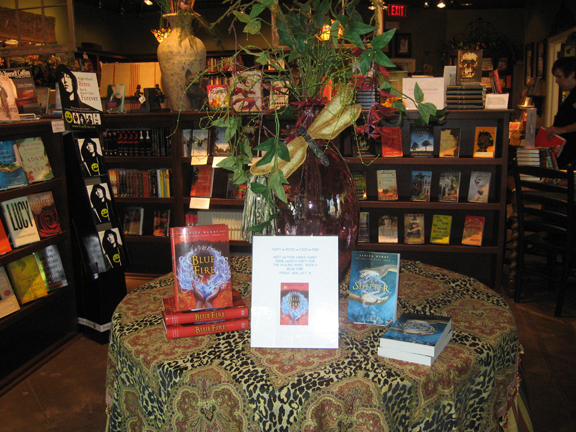 Night One was at Fox Tale Books, a wonderful independent bookstore in Woodstock, GA. They had the window all done up with my books and blue sparkle stuff and it looked really cool. We walked inside and were greeted by yet another display. 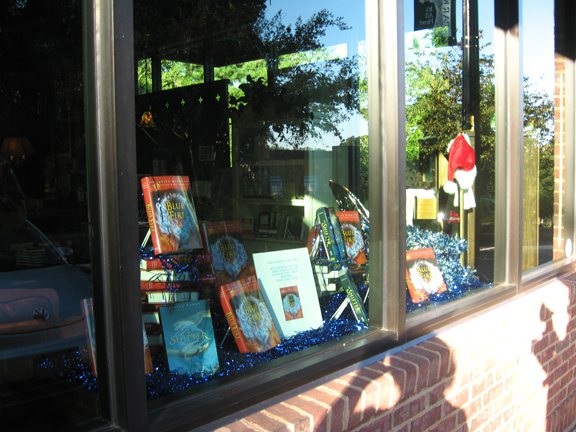 And yes, seeing my books in the windows and on display like this totally rocks. After a bit of socializing with the Foxes (the lovely gals who own the shop), it was time to set up the food and get ready for the guests. 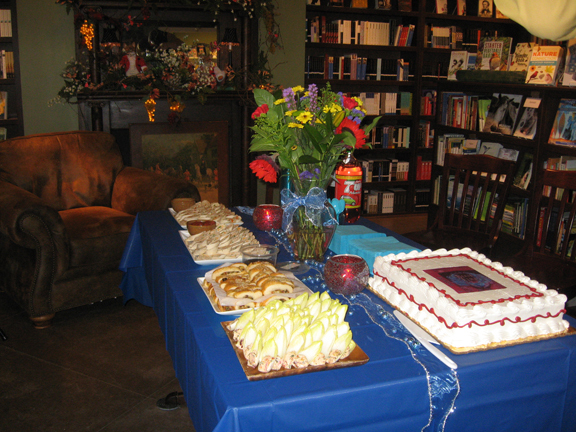 I had planned quite the spread for the evening, with some yummy snacks and a cake. ME: Can you put this on a cake? BAKER: Yes, but we're not allowed to due to copyright. ME: It's my book, for my book launch party. ME: -flipping open the cover- See? There's my picture. I can show you my driver's license. HEAD BAKER: We can do it, but you'll have to write a letter giving us permission. I wrote the letter and everything worked out. It's nice to see that they take copyright images seriously, but it cracked me up that I almost didn't get my own cover on a cake! 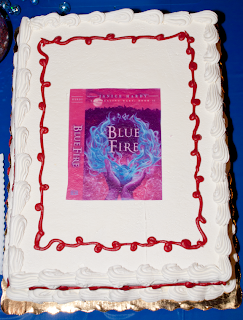 Guests started arriving, we joked and laughed and ate, then the Foxes tossed me up in front of everyone to talk about the book and writing in general. We had a great discussion, lots of good questions were asked, and they had to drag me off stage so I could sign books and let folks go home. Day two sent us to Barnes & Noble, for a more traditional book signing. I recruited my neighbor and a few of her friends to do hair braiding and face painting for the kids, and set up shop in the back. We also had some chairs set up so folks could hang out and chat after they got their books signed, and we had a nice informal mini-party going on all morning. The girls even went poaching for children when the face painting slowed down and brought back more customers. Spiders were big, and there were lots of cheeks with arachnids on them. 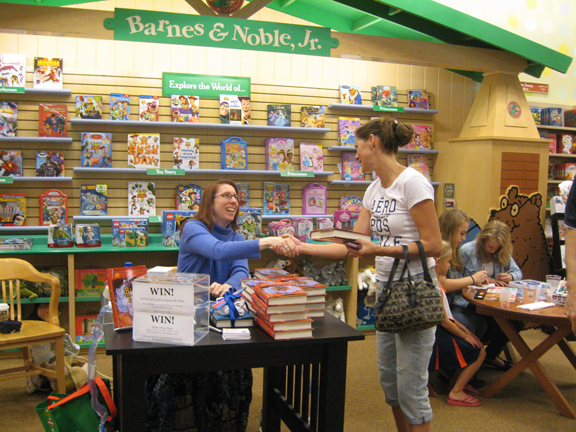 I got to meet some other bloggers and readers (Hi Kritsa!) face to face, and see some bloggers and readers I've met before, who even drove in from another state to see me! (Hi Sarah, and Kayelee!) It's always fun to meet folks I "see" online and put a person to the name. We wrapped up and went home, tired from all the fun, but in good spirits. Next time, I need to remember to take more pictures. They're doing a 24-hour read-a-thon for charity, so if you're in the area, stop on by that day.